Nineteen high schools are participating in the Re-Enrolled Student Project (RSP) this year. The success of RSP is due largely to the efforts of these schools to reach out and locate out-of-school teens in their community, get them re-enrolled and provide a consistently safe and structured learning environment where students can focus. 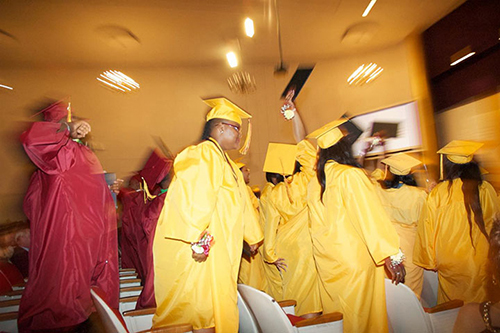 June 12, 2015 - Students from Prologue Early College High School celbrate graduation. Through RSP, ASN works with schools to understand barriers to education and identify opportunities to change reluctant learners into lifelong achievers. RSP helps to knock down these barriers by supporting the schools in developing high-quality educational programs and activities that minimize anxiety and maximize learning potential. Students discover how to embrace lifelong learning and self-motivation through successes. RSP re-enrolled 584 out-of-school teens in 2014/15. We are so proud to say that, thanks to the passion and commitment of our member schools, RSP has graduated over 2,000 teens that had previously given up hope on high school and dropped out since the program began in 2006. The Re-Enrolled Student Project helps steer tomorrow’s leaders towards a positive future by supporting college and technical school tours and preparation and participation in Job Fairs. RSP encourages schools to provide mentors and outreach coordinators to help navigate the challenges and celebrate the successes of each student. RSP also helps enrich students’ lives with exposure to unique and memorable cultural and multicultural experiences. Click here to view a list of the innovative schools participating in RSP and read more about how they succeed in keeping students encouraged, engaged and enrolled.